“Fox Movietone News: the War Years, 1942 – 1944,” a collaboration between the University of South Carolina and the Library of Congress, provides online access for the first time to over two hundred Fox Movietone News newsreels released in American theaters from September 1942 through August 1944. Before the era of television news broadcasts, newsreels were shown in theaters across the country to inform and entertain audiences. During the war, two newsreels per week were released by each of the five major American newsreel companies (Fox Movietone News, Universal News,Hearst News of the Day, Paramount News, and Pathé News). These 8 to 10 minute Fox Movietone News newsreels record how the world appeared on screen to the American public during the war. As a whole, the collection helps us better understand how the war was waged on the home front. The films reveal a concerted effort to sustain a sense of “normalcy” in America even as war ravaged much of the globe. Battlefield victories (and losses) were interspersed with beauty pageants and ball games. But even when light-hearted news dominated much of a newsreel, the war was an inescapable reality. 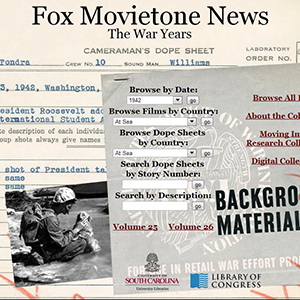 In addition to the released newsreels, “Fox Movietone News, the War Years, 1942 – 1944” provides users access to the archival paper records associated with each theatrical release. Like any newspaper or magazine, newsreels rejected many stories for publication. These paper records (also known as “dope sheets”) help us to look into the editorial decisions made by the staff at Fox Movietone News. Knowing which stories were rejected for a particular newsreel provides valuable insight into editors’ rationale for selecting stories for theatrical release.